Let’s talk splurges – kitchen splurges, that is! 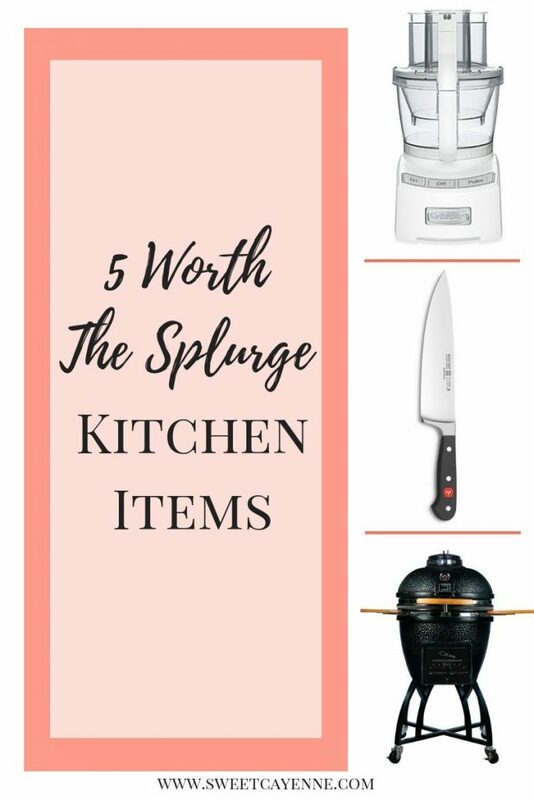 I’m sharing my top 5 splurge-worthy kitchen items and why I think they are worth the investment! A couple of months ago, I took some Instagram polls to ask my followers about what they’d like to see on Sweet Cayenne in the fall season. Kitchen items were a common theme – particularly those that I thought were “worth the splurge.” So I’ve put together a fun video showing you the items in my kitchen that I consider to be splurges, and tell you why they are worth it – watch below and keep scrolling for all the details! Costs more than $100 – all of the items on my splurge list cost more than $100. Only one of them was gifted to me as a wedding present. The rest of the items were things that I researched, saved for, watched for sales/promotions, and then purchased on my own. All of the items on my list can be found on sale at significant price reductions throughout the year, especially during the Memorial Day, Labor Day, and Thanksgiving holiday weekends. For our ceramic grill, we bought this on sale during the fall, when most outdoor cookware can be found at a deep discount. Will significantly improve your performance, efficiency, or both in the kitchen – the five items I’ve mentioned have all “upped my game,” if you will when it comes to helping me prep quickly and produces a better final product. For example, the ceramic kamado-style grill produces the best barbecue and smoked meats that I’ve ever tasted and would certainly be considered restaurant-quality. A good chef’s knife can help you cut produce more accurately, quickly, and safely when it is cared for and kept sharp. And a stand mixer allows you to multi-task – measuring items or doing other prep tasks while mixing – and will help you knead/incorporate air/mix more thoroughly than you would be able to by hand. Each item on this list makes cooking easier, more fun, and helps me enjoy my time in the kitchen. An item that will last more than 10 years – with the grill as the exception (we’ve had it for two years), I’ve had each item on the list now for 5-7 years. I’m hoping that with good care, all of the items I’ve mentioned will last well over 10 years and truly be an investment that I enjoy and get rewards from for decades! If you plan to save for and splurge on any of the items below, I highly recommend looking for deals on a holiday weekend or checking your local TJ Maxx and outlet stores for discounts on the previous year’s models. I’ve managed to save a ton this way and have never paid full price for any of my splurges. Depending on what is important to you – especially when it comes to the types of foods you like to cook and how often you cook – there are a few other splurge items that would be wise to invest in over time. These are not as essential, in my opinion, as the five items I’ve listed above. However, all of the items below can last a really long time when they are high-quality and cared for properly. Cookware – a high-quality set of pots and pans can really improve your kitchen performance and the quality of food you make, but can cost a ton initially! I’m slowly collecting pieces of All-Clad as I find them on sale at Marshalls and TJ Maxx. It’s a slow process, but I expect each piece to last a lifetime! Additional knives – like the All-Clad, I’m slowly collecting the Wusthof Classic knives as I find a good deal on them. I couldn’t afford to buy the set initially, so I plan to collect piece-by-piece. This collection can also last a lifetime if cared for properly! Blender – in my opinion, a food processor does everything a blender can do, with the exception of drinks and smoothies (you could do this in the food processor – it would just be hard to pour!). I’m not a big smoothie drinker, so I didn’t consider splurging on a nice blender to be worth it for me. However, if you’re into juicing and drinking a lot of shakes/smoothies, a high-powered blender like a Vitamix or Blendtec can totally be worth the splurge in the long run! I got lucky when Ryan won a Blendtec for us at a conference one year – it really does perform well and I’m glad I have it! Flatware – Ryan and I splurged on a good, sturdy, and heavy set of flatware at Pottery Barn by saving up gift cards from our wedding. We love how it has performed for 5 years now, and plan to use the classic set for decades to come. It’s especially nice to have when entertaining! And there you have it! If you enjoyed the post and video, please do me a favor and head over to my YouTube channel page. Give the video a “thumbs up” and subscribe to my channel so you never miss a video! Thanks for watching and reading!